Induction day! The new arrivals took a tour around the reserve, rehabilitation centre and living areas. This was a great way to get to know other people and the new environment. The highlight of the day was enjoying a game drive in the afternoon, seeing impala, rhinos, elephants and giraffe. Seeing the animals for the wild was breathtaking. After the game drive, participants had a hearty dinner followed by stories around the fire. A great end to an exciting day! Time for the work to begin! The day started at 8.30am with breakfast, and the first activity of the day starting at 9.30am. The morning activity consisted of road maintenance – this involved laying out rock debris and bricks and pouring sand over it to seal the pathway. Despite it being rather tiring, it was most rewarding because you could immediately see the fruits of the labour. After the road maintenance, participants headed to another part of the reserve to collect more rocks for the next session of road maintenance later in the week. Lunch was at 13.00, after which there was rest and relaxation time until the next activity at 14.30. This activity was very different – a zebra game count drive! 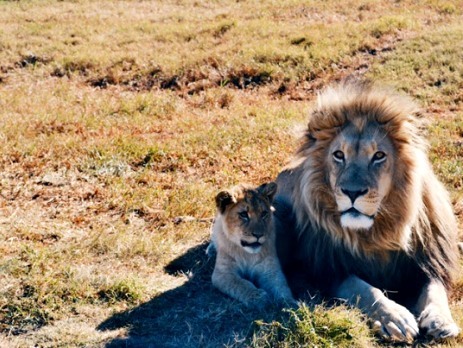 Game counts are for the purpose of calculating game reserve capacity. If there are too many predators in the reserve, this would cause a decline in the predated animals, and an imbalance in the ecosystem. In the same way, if there are too many grazers this would cause overgrazing, and a lack of food and biodiversity. After dinner there was free time, and a group of participants decided to watch a film, whilst others played cards and used the wifi. The morning activity was another demanding one – removing alien vegetation. Participants used machetes to cut down Black Wattle, an invasive Australian tree species that absorbs a lot of nutrients and water, thus preventing the growth of native trees. It took 2 hours to successfully cut down a tree, and it sounded like thunder when it eventually fell! Over lunch, several participants went to feed the marmosets before going out on a rhino monitoring game drive. The point of this activity was to locate the rhinos and see how they were doing as an anti-poaching measure. An exciting start to the day – relocating a zebra! The zebra needed darting so that it could be moved to another part of the reserve for breeding purposes. 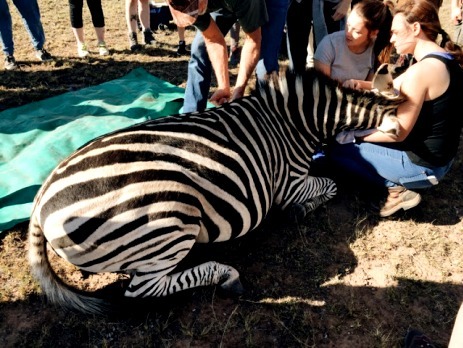 The vet and the vet interns (on a veterinary experience programme) darted the zebra before participants on both programmes helped with the relocation. It took 15 people to carry the zebra onto the tractor for it to be moved to the other side of the reserve! 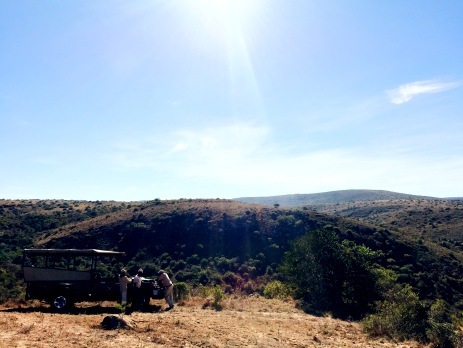 The afternoon involved a game drive to simply visit the game reserve and enjoy the animals living in the wild. Some participants had already left for the weekend to do some travelling. Earlier in the week everyone received a list of activities that the coordinators could arrange with advance notice. Most participants head to Port Elizabeth to enjoy the city life after a week in the wilderness! Fun in Port Elizabeth exploring the city, going whale watching, visiting the beach and enjoying city life! Road maintenance again today! Participants loaded bricks and rocks onto the truck and headed out to improve the roads again. During the activity, the rangers spotted some lions nearby, so everyone had the opportunity to chill out and watch them. 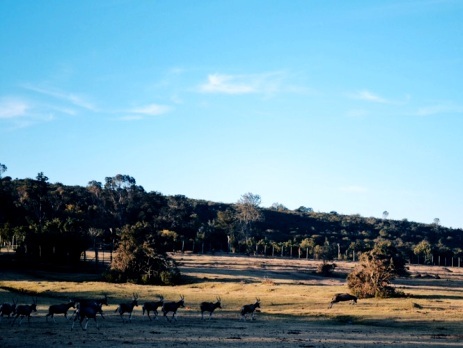 In the afternoon, participants headed out on a blesbok game count – total 126! Alien vegetation removal to start the day, followed by same more road maintenance before lunch. After lunch was an elephant project – it was amazing to see these huge graceful animals. Fun fact learned from the day – elephants can turn on and off their pain receptors. This means that they can eat cacti without feeling pain! This amazing day was rounded off by a night drive at 20.00. On the drive participants were lucky enough to see elephants, spring hares (South African kangaroos – much smaller than Australian ones! ), wildebeest and impala. A highlight was hopping out of the truck, lying on the grass and enjoying some star gazing. The stars here are just incredible. The morning brought a hike! It was pretty flat at first but got really steep for about 20 minutes before reaching a peak with stunning views over the reserve. The hike took about 2 hours in total to reach the top, and then participants sat and had a picnic overlooking the spectacular scenery below. The hike back was pretty steep and therefore slow, so participants arrived back at about 15.30. Everyone was very quiet after the exertions! Epic morning! Participants saw a pack of lions feeding on a zebra. Unfortunately they arrived to late to see the lions making a kill, but the feeding was still incredible. After that dramatic start to the day, participants did weed control around the fences. If the weeds grew too tall, it wouldn’t allow for the electric current to run through the fences and hence the animals could possibly escape – something to be avoided! In the afternoon it was back to rhino monitoring and then a sunset game drive. Everyone was up early today for a dawn drive at 6.30 – hippos were sighted! The views and the light changes were amazing and a real treat. This was to be Jasmine’s last day on the reserve before heading off for a long weekend trip to Jeffrey’s Bay, so the rest of it was spent packing. To find out more about this Big 5 conservation volunteer project, see our conservation experience page.